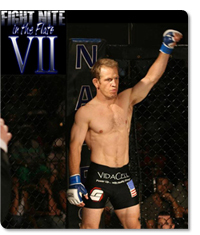 GreatLife sponsored MMA fighter Clint Musser put his amateur days behind him and joined the ranks of the NAAFS Pro Series with a win against Devin "The Marion Barbarian" Miller this past Saturday. Titled as the largest "Super Show in the Midwest", Cleveland Ohio's NAAFS Fight Nite in the Flats was the venue that launched Musser's new professional career. Clint gave VIDACELL a ‘great shout out’ during his post fight interview giving it credit for his energy and training endurance. The fight was attended by thousands of fans and also watched online via pay per view. Please join us in congratulating Clint on this great win! We know that this will be one of many more to come. Don't forget… if you’re looking for the kind of energy, stamina, endurance, muscle recovery, strength & performance that Clint experiences from taking VIDACELL, then make sure to add VIDACELL to YOUR daily routine! Many of us know Gregg Sturz as the President & Founder of GreatLife International, but did you know he’s also known around the GreatLife office as the “The Runner”? If you ever visit the GreatLife corporate office, there’s a good chance you’ll see Gregg sprinting through the hallways with a big smile on his face! If you ask him what he’s smiling about and why he’s running, he’ll tell you it’s because VIDACELL makes him feel so good! So, what does Gregg do with all this extra energy he gets from VIDACELL when he’s not helping GreatLife distributors with their business? He’s most likely playing tennis. Gregg started playing tennis at the age of twelve when his dad thought it would be a great way to spend some time with his son. That’s when Gregg’s love for tennis began. But unfortunately, as Gregg got older, his life got busier with family and corporate responsibilities that took up most of his time. He stopped playing tennis and focused on his children and his career. 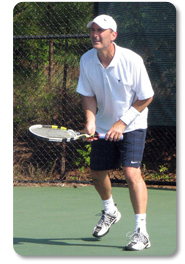 Today, at age 47 and enjoying the benefits of VIDACELL, Gregg has picked up right where he left off 30 years ago when he was the #1 player on his High School tennis team. He’s once again playing competitive tennis. What’s even more remarkable is he’s competing against opponents that are half his age… and winning! 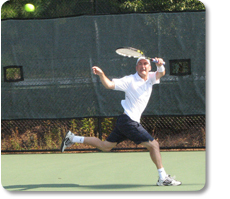 One of Gregg’s most recent memorable tennis experiences came this past summer when he played in 110° degree court temperature for 3 ½ hours to win a grueling 2nd round playoff match. Then, less than 30 minutes later, he competed in another tournament where he won in the Men’s Doubles AA Finals in a match that lasted over 3 hours! "I feel blessed that I was introduced to VIDACELL," says Gregg. "It definitely gives me the added energy, endurance and stamina I need to compete at such a high level. You don't see many people my age playing this intense and in these conditions. Quite often my opponents ask me what I'm taking to stay in such great shape? My answer is always: Have you ever heard of VIDACELL? It's the most incredible product you'll ever take!" One thing is for sure, Gregg's opponents better watch out because he's living proof that VIDACELL is making a difference! 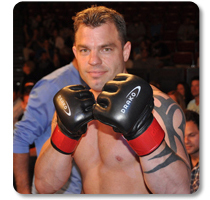 GreatLife International is a proud sponsor of MMA fighter and GreatLife distributor Nick Marinos. But, is he just another fighter trying to make it big in one of the world’s fastest growing sports? Not hardly! 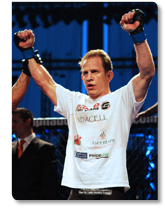 Consuming VIDACELL daily for extra energy and driven by the motivation and training of GreatLife distributor Fred Shadian, Nick Marinos is now a MMA champion… but it was a long hard road to achieve success. This short inspiring video clip, which originally aired on Canada’s CTV, of Nick’s life and road to success will surely touch your heart and move your soul.